Click photo to watch a gambler's cautionary tale. 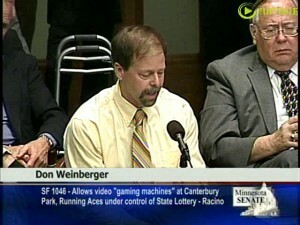 Don Weinberger is a recovering gambling addict opposed to expanded “racino” gambling in Minnesota. He graphically describes the cost gambling has had on his life and the cost it has on society. A proposal to allow electronic slot machines at race tracks is pitting horse racing against indian owned casinos. A Vikings stadium bill that now contains a provision for a racino was sent to the Senate Tax committee on a 9-6 vote. Senator David Hann (R-Eden Prairie) expressed concerns about the bill just before the Senate Finance Committee vote.